Heading a short distance west from Fiskardo brings you into one of the oldest villages on the Errisos Peninsula – Evreti. This is where the beautiful Villa Helios stands. 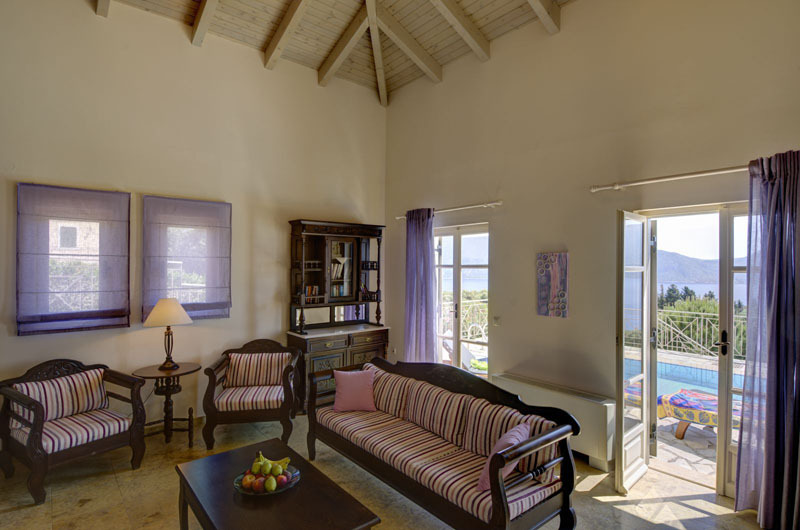 The fantastic elevated position takes full advantage of the stunning uninterrupted panoramic views over the treetops out to Doliha bay and beyond to Ithaca. Villa Helios gains its name from the sun which bathes this fabulous three bedroom house throughout the long summer months. 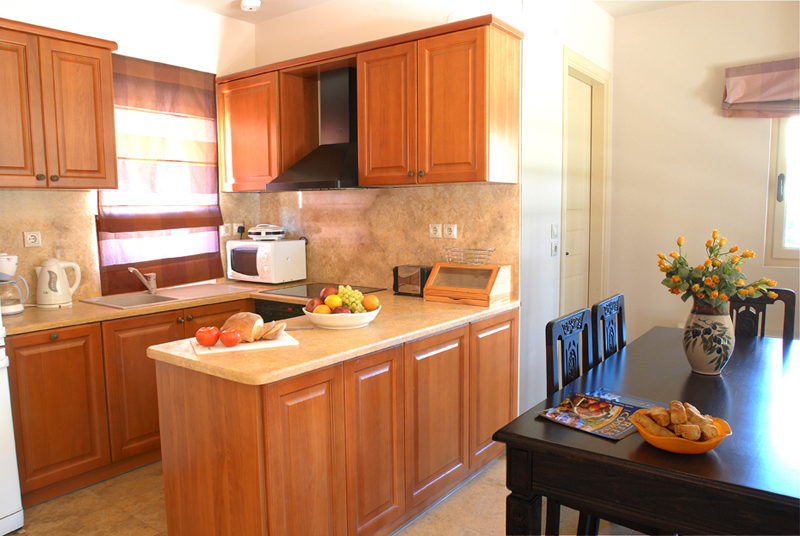 You enter the villa into a well equipped kitchen and dining area, steps take you down to the bright and airy living area. 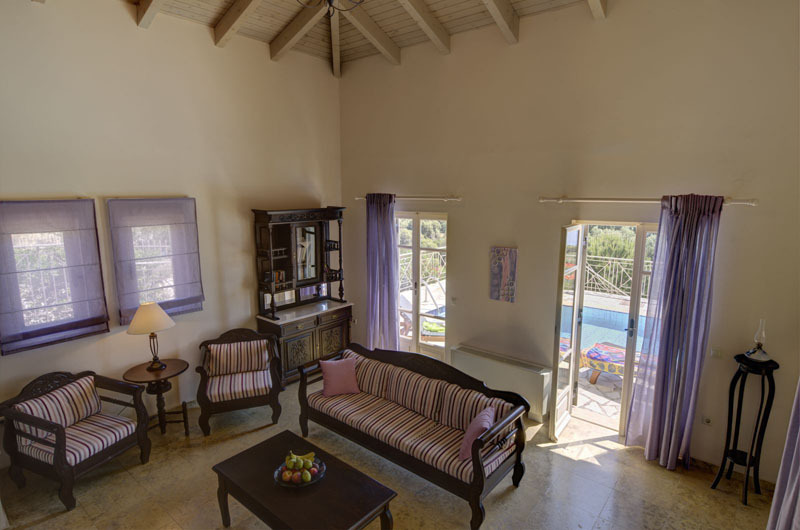 Double doors lead out onto the pool terrace and patio area with plenty of space to lounge in the sun or enjoy the al fresco aspect of Greek holiday living, with the large barbecue and outside covered dining terrace. On this level there is a separate shower room with WC, and twin bedroom that opens out onto the patio. The upper level is where you will find two further bedrooms a double with en suite shower room and twin with en suite bathroom. 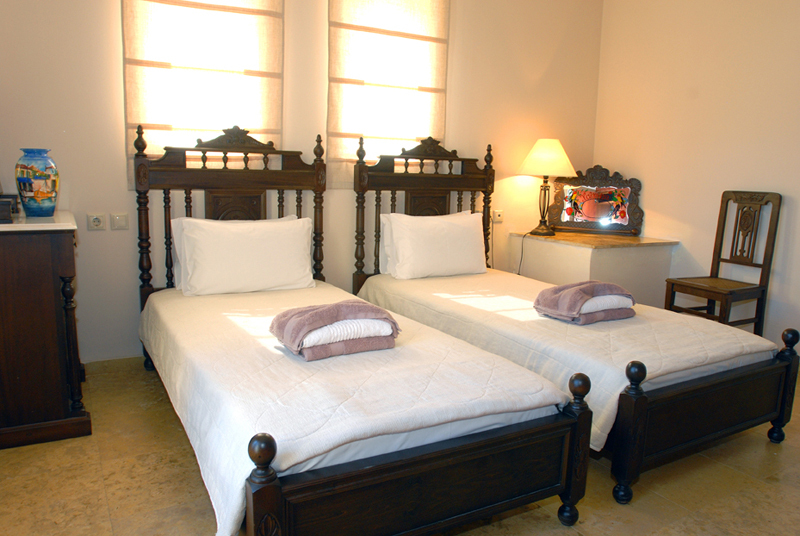 Both bedrooms are light and spacious with superb views and both air-conditioned. A short drive towards Fiskardo, will bring you to the beautiful Foki Bay, with its crystal clear water, a large tree shaded beach and taverna. Five minutes further and you arrive in the picturesque cosmopolitan harbour of Fiskardo with numerous restaurants, tavernas and shops. Closer to Evreti, in the opposite direction takes you to the village of Manganos, where you will find a fully stocked mini market, greengrocer and tavernas. Villa Helios is ideal for families or a group of friends. Whether you want to simply relax by the pool and enjoy breathtaking scenery or explore the island further. This hillside villa offers you a relaxing base and is perfectly located to take full advantage of everything the island has to offer.